The industry's BEST source for finding, buying and planting native. Find Florida native plants and the professionals that grow, plant and maintain them. 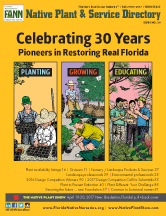 FANN’s annual Native Plant & Service Directory is the horticulture & landscape industry’s most respected and widely used source for locating Florida native plants. Hundreds of different Florida native plant species and dozens of growers, environmental consultants and landscape professionals eager to make your native project a success. Customers hold onto this highly valued reference for years. Distributed by mail to qualified wholesale clients. Flip through it online.